Katherine (Kate) H. Hovde is a senior advisor in education issues for the Center for High Impact Philanthropy in the School of Social Policy & Practice at the University of Pennsylvania. She has particular expertise in education policy, program design, and evaluation, both in the U.S. and abroad. In her role at the Center, she serves as point person for a broad set of partnerships with education researchers, funders, and leading nonprofit organizations, and leads Center efforts to synthesize and communicate research and other evidence on effective models for donors seeking to improve student outcomes. 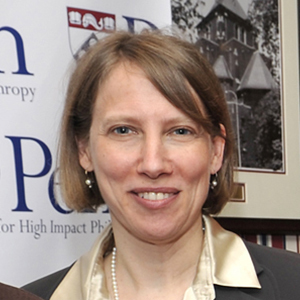 Kate has worked extensively for the World Bank (in Latin America, South Asia, and Eastern Europe), as well as for the Consortium for Policy Research on Education (CPRE) at the University of Pennsylvania. She has a Masters in International Affairs from Columbia University.